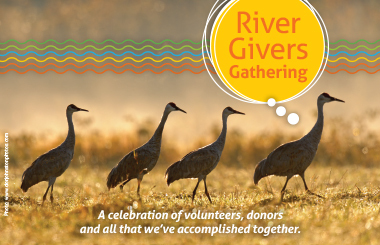 Join HRWC for a River Givers Gathering! A celebration of you—the volunteers and donors who work to protect our home river—and all that we’ve accomplished together. There will be live music from the Pontiac Trailblazers, food, science, door prizes and fun for all ages. We’ll launch our spring-summer field season and we’ll present our annual Stewardship Award to two very special volunteers. For those who love the data, there will be a 2pm breakout session on what we learned from our 2018 chemistry and flow monitoring about the health of the Huron River. And HRWC staff will be on hand throughout the event to answer all your questions about the Huron River. The event is FREE for all River Givers who have volunteered or donated to HRWC in the last 12 months and accompanying friends and family! Want to join the fun? Become a member or sign up to volunteer before March 3rd. There are a few upcoming volunteer opportunities to choose from: Chemistry and Flow Monitoring (March 23rd or 30th) and River Roundup (April 27th). Register to volunteer and join us for River Givers!